Broker participation is a very important part of the auction process. We are happy to work with our colleagues in the industry to help their clients buy and sell property. Agents can easily earn commissions on quick auction sales while getting their clients the best deal possible. Because we are realtors as well as auctioneers, we understand that clients needs can be met in many ways. Our services are always open to any agent who would like to open their clients up to the auction process. Home sellers who have had their home on the market with little to no traction should explore having an auction. Lowering the price over and over is frustrating and time consuming. If your seller has run into a situation where they must sell quickly, an auction can be an ideal fix. Please print out the Broker Participation form below if you would like to register your client for one of our upcoming auctions. 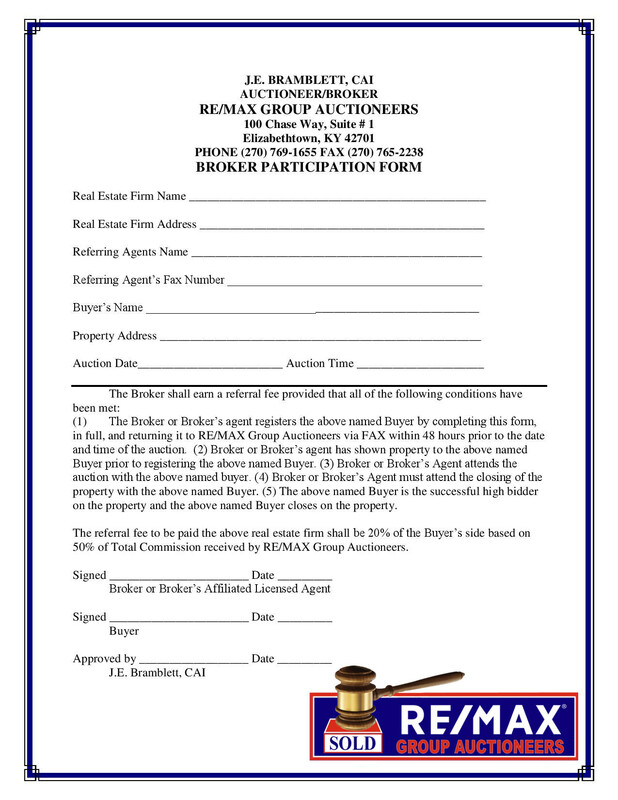 RE/MAX Group Auctioneers reserves the right to accept or decline any Broker Participation request. The Broker Participation form must be completed and submitted to our office at least 24 hours prior to the auction. The Broker Participation will not be accepted unless it is completely filled out. It must also be signed by the broker and their client. Buyers must still register with the auction clerk the day of the auction to receive their bidder number. Thank you for your participation. It is our pleasure to work with you. We thrive on friendly and social cooperation. We look forward to working with you and seeing you on auction day!